New Land’s Glendale Project. Rendering by Korb + Associates Architects. Milwaukee-based development firm New Land Enterprises is planning a $12.5 million project in Glendale. 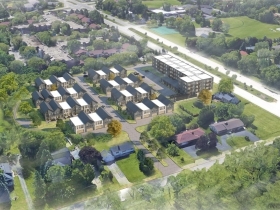 The project would include 41 townhomes and a 48-unit apartment building on a site on W. Good Hope Rd. The 5.4 acre site at 2510 Good Hope Rd was formerly the Prange Greenhouse, Jeff Rumage reported in the Milwaukee Journal Sentinel. 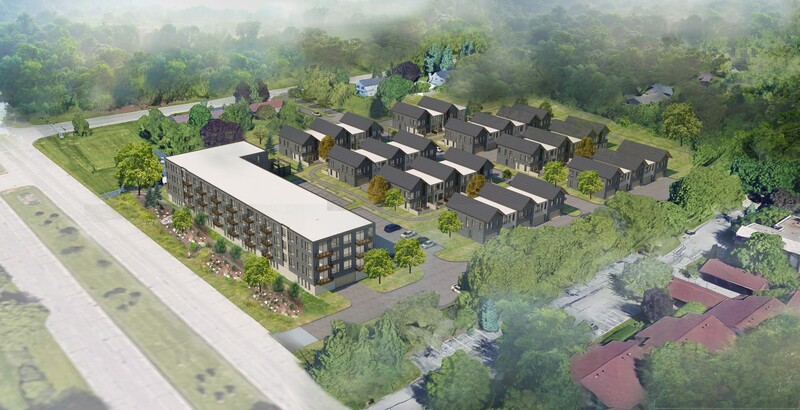 Renderings for the apartment complex show a four-story building. 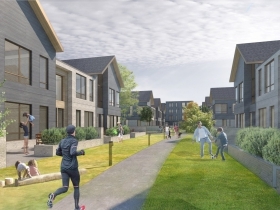 The townhomes will be split between eight buildings, and each unit will have two indoor parking spaces. In total, the project will feature 180 parking spaces. Korb + Associates Architects is serving as the project architect. The project needs a zoning variance from the City of Glendale to move forward. Bachman Furniture Gallery has become latest business to move to the Menomonee Valley. The company purchased a 60,000-square-foot building at 1741 W. St. Paul Ave for $1.5 million, Tom Daykin reported in the Milwaukee Journal Sentinel. Along with the building, the furniture company also bought a parking lot between 1800 and 1806 W. St. Paul Ave.
Two new historical landmarks have been chosen in Milwaukee. The Milwaukee County Historical Society voted this week to designate the Women’s Club of Wisconsin at 813 E. Kilbourn Ave. and the site at the northwest corner of Buffalo and Water streets where George Marshall Clark was lynched in 1861 as historic. The designation honors the significance of the places in Milwaukee’s history. A defense contractor, that has had its name withheld in public filings, may build a headquarters and manufacturing facility in Menomonee Falls. The company is reported to already be located in a nearby community, but searching for a much larger facility. Arthur Thomas reported in BizTimes that the project would include developing a 350,000-square-foot industrial building for high-tech manufacturing and remodeling a 120,000-square-foot office building in the Woodland Prime Business Park. 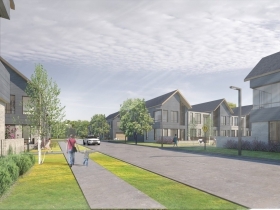 The project, if it moves forward, would potentially bring 600 jobs to Menomonee Falls.